Exxact Corporation has chosen Matrox C-Series multi-display graphics cards as the heart of three new video wall and digital signage systems. One of the new systems, the Exxact MPX3000 with Matrox C680 inside, will be presented at InfoComm in the Matrox booth 4053. Additional Exxact systems will be featured in the Exxact booth 2987. Each Exxact MPX3000 contains a Matrox C680 multi-display graphics card. MPX3000 incorporates a Matrox C680 card to drive up to six displays from a single, short-depth 1U system. 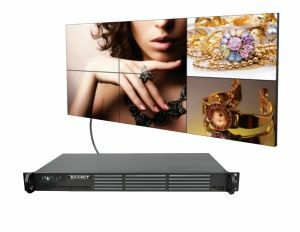 The Spectrum IXR416-0064N image generator features two Matrox C420 or two C680 cards to drive up to 12 displays from a single 4U rackmount system. Spectrum TXN003-0032N uses either a Matrox C420 or C680 to drive up to six displays or projectors from a single small-form-factor system. Matrox C-Series cards feature 2 GB of on-board memory and secure mini DisplayPort connectivity. Matrox C680 supports up to six 4K/UHD displays. More displays can be supported by inserting two C680 cards into a system. The board-to-board framelock feature ensures synchronization of all displays to reduce tearing on digital signage and video walls. Matrox C420 is a quad card with passive cooling for increased reliability and silent operation. The cards come bundled with Matrox PowerDesk for Windows desktop management software.